Rock doves are common on all main Hawaiian islands. They are also known as Domestic Pigeon. 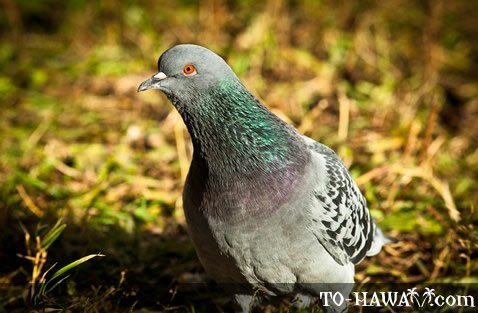 Native to Europe, Africa and Asia, rock doves were introduced to Hawaii in 1796. Adult males and females look similar. Wild rock doves are grey with a shimmering neck, a gray tail and black wingbars. Some urban rock doves are white with a red bill and legs. Rock doves live in the wild along cliffs and mountain gorges as well as in cities and towns. In cities they like to roost on buildings. They feed on seeds and many types of food that humans leave behind, such as bread crumbs.